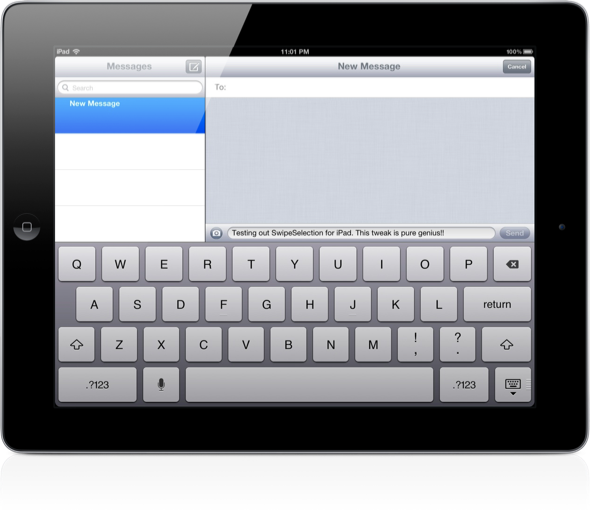 This Tweak For iOS Brings iPad Keyboard Concept To Life – Download Now! The innovation, dedication and commitment to user experience of the jailbreak development community never ceases to amaze us. It was only yesterday when a concept video did the rounds which showed a more user friendly method of highlighting, selecting and editing text on the iPad. In a community where time seems to stand still when developers are pushing out tweaks, a quick thinking coder has pushed out his SwipeSelection tweak to Cydia that mimics the exact functionality that was shown in the concept video. The whole basis of SwipeSelection is to make the selection, highlighting and editing of text on the iPhone and iPad a lot more user-friendly and intuitive by implementing a variety of swipe-based gestures, something which Apple makes use of extensively throughout iOS. Editing text is something which Apple hasn’t really paid much attention to when releasing new versions of the OS, meaning that the native methods feel a little cumbersome, outdated and touch heavy. After installation, the SwipeSelection tweak makes itself at home in the deepest depths of iOS and doesn’t come with any additional home screen icons, as it alters the text selection methods within the OS. 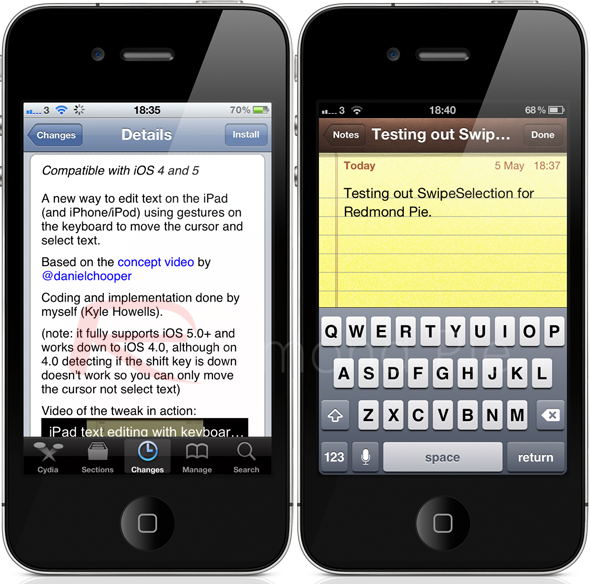 The tweak is an exact implementation of the concept video, meaning that it brings three core text highlighting techniques. Swiping along the string of text on the screen with one finger allows the user to efficiently move the cursor to the desired location, something that replaces the old tapping and holding method which we all know isn’t as precise as we would like. In addition to the one finger cursor moving, swiping with two fingers will offer the same feature but will do so at an accelerated rate. Pressing and holding the shift key while swiping with one finger along a string of text will highlight the numbers and letters, allowing users to cut, copy or paste over the top using the normal action menu pop-up. 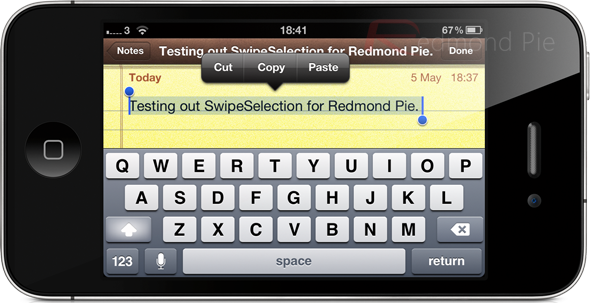 The quick, user-friendly gestures that are implemented by the SwipeSelection tweak certainly makes text editing a lot more intuitive on an iPhone or iPad and hopefully will be something which Apple will/should implement in future releases of iOS. SwipeSelection is available from the BigBoss repository as a free of charge download.